Fiction – paperback; Penguin; 142 pages; 2007. 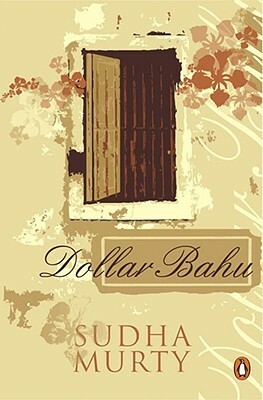 Sudha Murty’s Dollar Bahu is a rather sweet, if overly moralistic, novella that explores the age-old notion that the grass is not always greener on the other side. Written in basic, simplified prose, it reads very much like a fable about what happens if you value money above all else. It tells the story of a middle-class Indian family: Shamanna and Gouramma and their (spoilt) daughter, Surabhi, and two sons, Chandru, a software engineer, and Girish, a bank clerk. When the company that Chandru works for posts him to the United States on a two-year secondment, all the family’s dreams, it appears, have been answered. Not only will Chandru be able to send money home that can be used to add an upper storey extension to their modest house and finance Surabhi’s marriage, it will also elevate Gouramma’s social profile, because having a son in America is something to boast about. She [Gouramma] would dream about the Dollar, that magic green currency, which could change her house and fulfil her dreams. It was the Dollar, not Indian rupees, which could elevate her into the elite circle at social gatherings and marriage halls. The Dollar was like the Goddess Lakshmi, with a magic wand. While Chandru is in America, Girish marries a teacher, Vinuta, whose dreams to become a singer have been thwarted by lack of opportunity and finances (she was orphaned as a young girl). As tradition dictates, the couple lives with Girish’s parents. Vinuta, keen to make a good impression, works tirelessly to keep the family home in order, but she is soon taken advantage of by her mother-in-law. She’s ground down by a heavy workload, treated badly and never spoken to warmly. At its heart this is a book that explores greed, prejudice and respect (or lack thereof) for other people. It dissects the differences in values and customs of both America and India, albeit rather simplistically. But this is not a novella that is interested in nuance or shades of grey: it’s completely black and white and as blunt as a spoon. At its most basic it paints America as a rich but soulless country, where family ties and personal connections are not important; and India as impoverished and slightly backward but where the traditional values of family and marriage are sacrosanct. Dollar Bahu is wholly predictable, the characterisation is poor and one-dimensional (the nasty mother-in-law, the greedy daughter, the stuck up daughter-in-law, the wise father and so on) and a little too reliant on cultural stereotypes to be anything other than a light read. It feels like it’s aimed at uneducated Indians, warning them that America is not the paradise they might expect it to be — or perhaps I’m simply reading too much into it.